Summer is here, and along with it has come my taste for refreshingly crisp summer salads. I'm impressed with myself these days, heading out to the grocery store and staying within the realms of the produce section and not venturing over to the aisles laden with dangerous goods (mostly chips, ok sometimes cheese and maybe crackers). As Shankar and I hit the year and a half mark on our marriage we're beginning to see a lot more accumulation of things in our home. More dishes and pots in our kitchen, more clothes, more electronic goods, and unfortunately more pounds on the scale. I've decided to be really serious about removing the added baggage that has inconveniently deposited itself on my hips. I guess that it is a comfort zone thing, and yeah I was so much more conscious of my fitness level when I was on the market, and now we tend to choose going out together over going to the gym. At the end of the day feeling good is definitely linked to looking good, so its time to start working out again. Fortunately for me the market (this time I mean the produce market) is filled with delicious fresh and healthy vegetables and fruits to tempt my palate. This recipe resulted from an experiment where I substituted lettuce leaves for pita bread. Romaine lettuce leaves are crisp and sturdy enough to be filled with this nutritious Mediterranean salad. The cous cous would be fabulous stuffed into small romaine hearts and served as an appetizer, or eaten as I have shown here for lunch. They travel pretty well, you could pack the lettuce leaves separately from the cous cous, and assemble before serving. The boats can be made up plain or by spreading a layer of hummus on the leaves first. I recommend both. Of course the hummus adds so much more to the flavor (and fat). If you don't have hummus, open a can of chickpeas and add them for some protein. This recipe makes about 8 boats. Cous cous is made from semolina wheat flour and you can find more information about cous cous on Wikipedia here. 1. Add hot water to the cous cous to cover it. Let stand for a few minutes until the cous cous absorbs the water and becomes fluffy. 3. 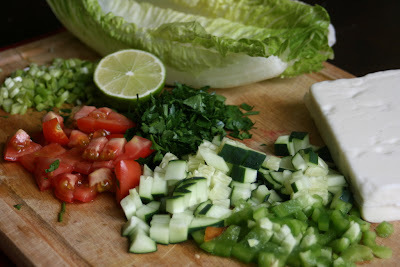 Add all the vegetables and herbs reserving the lettuce leaves. 4. Add the salt, olive oil, lemon juice and mix. 5. Spread the leaves with hummus (optional). 6. Fill the lettuce leaves with the cous cous salad. 7. Garnish with crumbled feta cheese, and radish slices. * You can roast and grind the sesame seeds into a powder before adding to the blender. We have done it by adding the sesame seeds straight and it still tasted great. ** These measurements are really approximate, I find that you just need to keep tasting and adjusting the hummus. 1. If using the dry chickpeas rinse them, cover with water and pressure cook for 20 minutes on high, and 20 minutes on low heat. 2. Grind all ingredients in a blender (my blender is smaller so I do it in two batches). 3. Drizzle the olive oil through the top of the blender until a nice thick but smooth consistency is reached. those boats look real pretty. you have all the lovely combinations in there. healthy and yummy. Eating right always feels good! That's a cool salad recipe! I like how you used lettuce intead of a pita to make it a low carb option! Very colorful and healthy recipe.